BDM-100 is a universal reader and programmer that allows the user to read and program files in the ECU supplied with Motorola MPC5xx processors. BDM-100 requires the ECU to be opened and removed so that you can connect a flat cable to a specific area to the ECU. The other end of the BDM100 is connected to the USB port of any computer. BDM100 will allow you to create copies of the ECU software. Chip tuning of ECUs with Motorola MPC555 - 565. 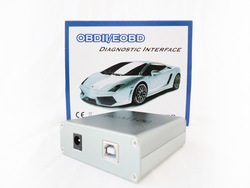 Allows users to read and program the complete ECU. 29BL802 SSOP eprom file (or ROM memory with maps if eprom physically not present);MOTOROLA MPC5xx Processor file; Serial Eprom content. The BDM100 connects these solder pads of the BDM port with the WinOLS PC over the USB bus. The BDM100 gets its operating voltage from the USB bus. The ECU needs its own supply voltage of +12 volts. Notice: Always shut off anti-virus programs when installing diagnostic software as virus programs assume they are virus because of the .exe file extensions.